Stamford has three Blue Plaques, one celebrating Sir Malcolm Sargent in Wharf Road and two erected by the Society. The first of these two commemorates​ William Stukeley and was placed in Barn Hill in 2010. The second was commissioned in 2018 for Nelson Dawson in St Mary's Street, pictured here. 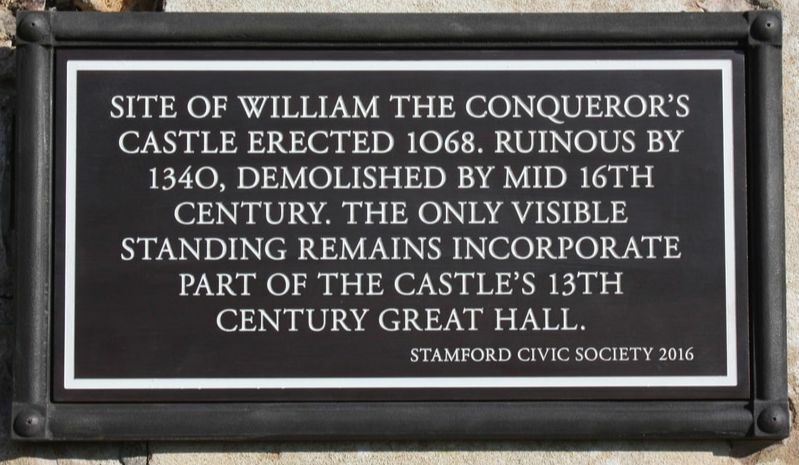 There are a number of other plaques on buildings and sites in Stamford. Most of these were erected in 1922 by a committee of the Tradesmen's Association. Four of the 1922 plaques were lost or stolen over the years, and in 2016-17 the Society replaced them with the new plaques pictured below. (Click the pictures of the plaques to see larger versions.) The Society has adopted a policy for supporting the provision of new plaques. This list quotes the original wording and the replacement 2016 text where applicable. Although the Society does not believe them to be 100% historically accurate, they do offer an interesting view of the town, and an afternoon could be well spent finding them all! The list starts to the west of the town, about a quarter of a mile upriver from the Town Bridge, and moves generally eastwards. ​2. West Street - the Bastion. ''Here stood St. Peter's Gate, dismantled in 1770. On the south side was built and endowed the same year Hopkins' Hospital by John Hopkins, the then mayor. The tower or bastion some thirty yards to the north, in West Street, is the only one now standing." ''This is the site of Sempringham Hall a school of the Gilbertines, founded in the thirteenth century"
2016 text: "Site of William the Conqueror's castle erected 1068. Ruinous by 1340, demolished by mid 16th century. The only visible standing remains incorporate part of the castle's 13th century great hall. ​2016 text: "Here for several centuries the pillory stood. This form of public punishment was abolished in 1837. The building opposite with the roof lantern was probably a medieval guildhall." Original text: ''In the house on the site of No. 9, King Charles I slept for the last time as a free man (4th May 1646). Through the gateway of the house leading to the North he passed disguised as a servant. Two days afterwards he surrendered to the Scots' Army." 2016 text: ''William Stukeley, the noted 18th century antiquary lived in the house opposite, No 9, 1743-48. The structure above was part of the house forming a bridge that spanned the road. It housed Stukeley's study and library. 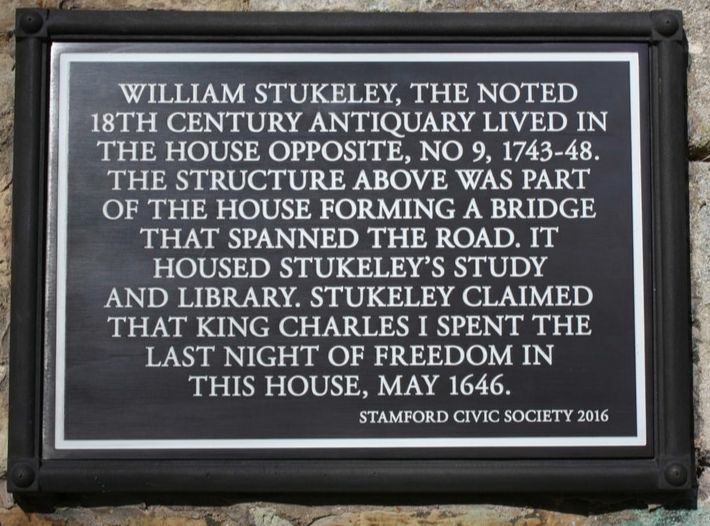 Stukeley claimed that King Charles I spent the last night of freedom in this house, May 1646." ''Flood line 15th July 1880." ''In mediaeval times when the house of the holy sepulchre stood on this sites Knights of Saint John of Jerusalem were entertained here. In the garden at the rear, crusaders in their black robes with white cross walked and talked. The gnarled mulberry tree dates from the time of James I. The main block of the Hotel was erected in 1597 by Lord Burghley, Lord High Treasurer to Elizabeth I. At least three kings and many other famous travellers have stayed here." ''This building was erected in 1768 as the Stamford Theatre and was used for more than 100 years. Macready, Kemble, Edmund Kean, Sheridan Knowles, Mr. and Mrs. Charles Kean and other notables performed here. ''Here are the remains of St. Paul's Church. It ceased to be used as a church in 1548 on the merging of the parish with St. George's and has since formed part of the Stamford School premises." 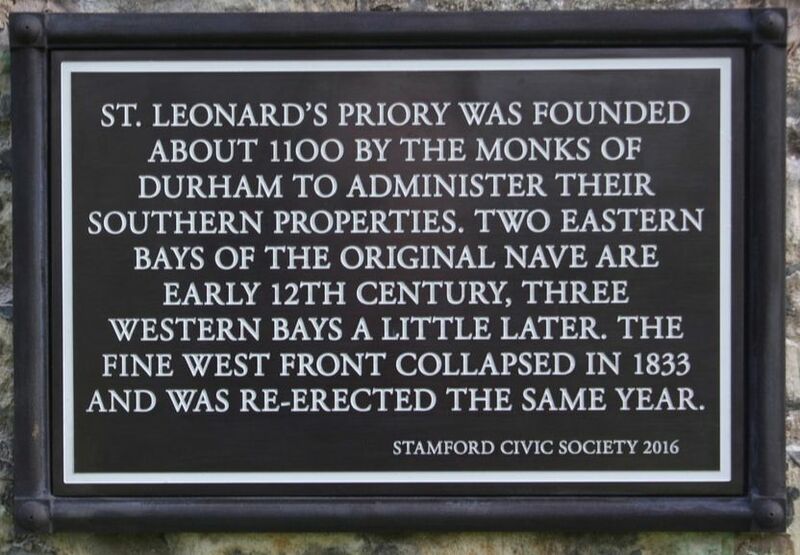 ''On this site formerly stood the Church of the Holy Trinity which was totally destroyed when Stamford was pillaged by the Lancastrian Army in 1461." ''Site of the Grey Friars Monastery (1220 - 1539). Here lies the remains of Joan, the Fair Maid of Kent, wife of Edward the Black Prince, and the mother of King Richard II. She was buried here in 1385." Original text: ''St. Leonard's Priory was founded in the 7th century by Wilfred, tutor to the son of the Saxon King Oswy. The present pillars and arches were erected by William II about 1090. The west front was rebuilt in 1150." ​Page updated in March 2017 with four replacement plaques, updated text and a renumbered list.